For the crust, I used whole wheat flour for a quick, no-knead dough. When forming the pizza crust, I made it thin with a raised edge to contain the quiche. You could make whatever kind of quiche you want; we enjoyed tomatoes, green peppers, mushrooms and cheddar topped with mozzarella. Our kids tore into it, veggies and all! Prepare the pizza dough: Dissolve sugar and yeast in warm water. In a medium bowl, mix the flour and garlic powder. As soon as the yeast is totally dissolved, add it to the flour all at once and stir it in. With a mixing spoon, scrape all of the flour off of the sides and stir it into the forming dough ball. Once all of the flour is in the dough ball, pour a bit of olive oil into to bowl (about a teaspoon) and gently roll the ball in it to coat. Set the ball aside to rest for at least five minutes. Fifteen is better if you have the time. Form the crust: Pour about a tablespoon of olive oil onto the center of a cookie sheet. With your hands, smear the oil around the pan, a few inches from the center. Oil on your hands will help quickly make the crust. Place the dough ball in the middle, and press it out into a larger circle, working from the center out, until you have about a fourteen inch circle. Press the circle so it is it uniform with extra at the edge. Fold up and pinch the edge all the way around to make a ridge, three-quarters of an inch deep. Set the crust aside and allow it to rise while you prepare the rest of the pizza. Prepare the quiche: Either drain a can of unsalted, chopped tomatoes or chop up two medium tomatoes. Slice the green peppers to half-inch cubes, and dice the mushrooms. Crack the eggs into the bowl you used to make your dough. Whisk them then stir in the veggies, grated cheddar, basil and oregano. Pour the mixture into the pizza crust and top it all with mozzarella. Bake for about 19-20 minutes. If your oven is uneven, turn the pizza after 15 minutes to ensure even browning. I shared this recipe at Meatless Mondays and Make Your Own Monday, Fat Tuesday, and Real Food Wednesday, Healthy 2Day Wednesday, Simple Lives Thursday, Full Plate Thursday, the Ultimate Recipe Swap, and the Friday Vegetarian Potluck, weekly roundups of natural recipes. I think I'll add this to my menu next week. Thanks for the pin! With any luck, your picky wee'un will like this. We would love your Pizza Quiche. 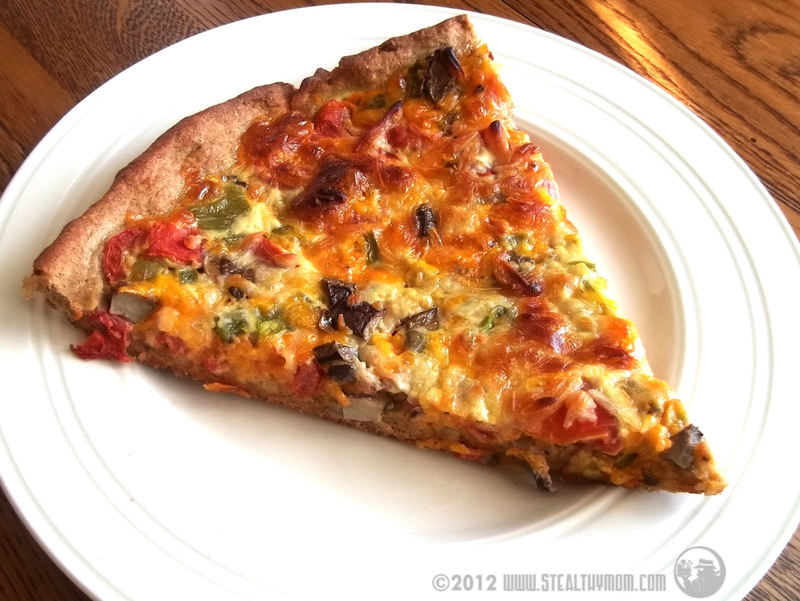 The whole wheat crust and the veggies would make it a real winner for us! Hope you are having a great week end and thank you so much for sharing with Full Plate Thursday. Looks super yummy! And thank you so much for linking up at Healthy 2day Wednesdays! Thanks for sharing the recipe with our Walking on Sunshine FB page last night. It will be tonight's Recipe Pick of the Day! Looks delicious!